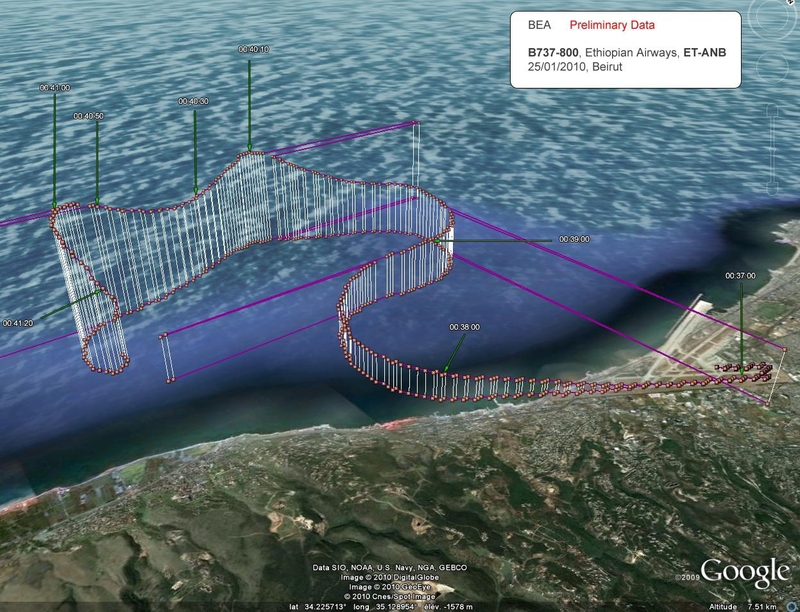 The Lebanese Ministry of Public Works & Transport released their investigation progress report regarding the January 2010 fatal accident involving a Ethiopian Flight 409 off the coast of Beirut. On January 25, 2010 a Boeing 737-8AS (WL) passenger jet, registered ET-ANB, was destroyed in an accident 6 km southwest off Beirut International Airport (BEY), Lebanon. All 82 passengers and eight crew members were killed. The airplane operated on Ethiopian Airlines flight ET409 from Beirut International Airport (BEY) to Addis Ababa-Bole Airport (ADD). The flight departed at night on an instrument flight plan. Low clouds, isolated cumulonimbus (CB) and thunderstorms were reported in the area. After take-off ATC (Tower) instructed ET 409 to turn right on a heading of 315°. ET 409 acknowledged and heading 315° was selected on the Mode Control Panel (MCP). As the aircraft was on a right turn, Control suggested to ET 409 to follow heading 270° “due to weather”. However, ET 409 continued right turn beyond the selected heading of 315° and Control immediately instructed them to “turn left now heading 270°”. ET 409 acknowledged, the crew selected 270° on the MCP and initiated a left turn. ET 409 continued the left turn beyond the instructed/selected heading of 270° despite several calls from ATC to turn right heading 270° and acknowledgment from the crew. ET 409 reached a southerly track before sharply turning left until it disappeared from the radar screen and crashed into the sea about five minutes after the initiation of the take-off roll. The flight recorder data revealed that ET 409 encountered during flight two stick shakers for a period of 27 and 26 seconds. They also recorded 11 “Bank Angle” aural warnings at different times during the flight and an over-speed clacker towards the end of the flight. The maximum recorded AOA was 32°, maximum recorded bank angle was 118° left, maximum recorded speed was 407.5 knots, maximum recorded G load was 4.76 and maximum recorded nose down pitch value 63.1°. The flight crew’s mismanagement of the aircraft’s speed, altitude, headings and attitude through inconsistent flight control inputs resulting in a loss of control. The flight crew failure to abide by CRM principles of mutual support and calling deviations hindered any timely intervention and correction. The manipulation of the flight controls by the flight crew in an ineffective manner resulted in the aircraft undesired behavior and increased the level of stress of the pilots. The aircraft being out of trim for most of the flight directly increased the workload on the pilot and made his control of the aircraft more demanding. The prevailing weather conditions at night most probably resulted in spatial disorientation to the flight crew and lead to loss of situational awareness. The relative inexperience of the Flight Crew on type combined with their unfamiliarity with the airport contributed, most likely, to increase the Flight Crew workload and stress. The consecutive flying (188 hours in 51 days) on a new type with the absolute minimum rest could have likely resulted in a chronic fatigue affecting the captain’s performance. The heavy meal discussed by the crew prior to take-off has affected their quality of sleep prior to that flight. The aircraft 11 bank angle aural warnings, 2 stalls and final spiral dive contributed in the increase of the crew workload and stress level. Symptoms similar to those of a subtle incapacitation have been identified and could have resulted from and/or explain most of the causes mentioned above. However, there is no factual evidence to confirm without any doubt such a cause. The F/O reluctance to intervene did not help in confirming a case of captain’s subtle incapacitation and/or to take over control of the aircraft as stipulated in the operator’s SOP.